The ride to Ljubljana was beautiful, rolling gently back and forth through hilly terrain that put me in mind of Wisconsin. I got some SIT from an ATM, which told me that my balance was 971,604.27 SIT. So, even in Slovenia, I’m not a millionaire. I had become accustomed to calculating old lire prices by dividing by 2,000, so it was difficult to deal with the fact that prices were quoted to me with the decimal point slid once to the right, as SITs are valued about 230 to the dollar. It is also hard to deal with the locals talking about “tolars” which sound like “dollars” so that the price I can most readily grasp is “euros” which is essentially the same as the “dollars” that I am used to, though the Slovenians have to adjust from calling them “marks”. I spent a lot of time walking around town comparing hotel prices. The best I could find was €42 at the “cheap” Park Hotel. The hostels are only open in the summer: right now they are student dorms. I could have gone 4km over to the “Bit Center” which is a hotel and sports complex. They evidently have dormitory beds as well. I settled for a room in a guest house for two nights at $20 per, courtesy of the Tourist Information Center. The lady at the guest house had me trade my shoes for slippers, and set me up on the top floor, in a cozy attic room. It was a double that she was letting to me at the “single use” rate of 4,500 SIT. The cozy double made me long for Janet, which made me feel all the more lonely for travelling alone. That evening I hiked back into the center of town for an unremarkable dinner, after which I retrieved my bag from the train station. The weather was bad, so I stayed in and drowned my loneliness by playing “Civilization 3” on the laptop for a couple of hours. It worked well, and seemed a decent solution given that I had finished _Catch 22_ and was otherwise out of reading material, alone in a single room in a house, without the socializing opportunities of a good youth hostel. That night I slept beneath a solid roof that was battered by a wonderfully fierce thunderstorm. This morning I was up at 6:30, greeted by the old lady en route to the bathroom. It was dark, cold, and rainy outside, and I didn’t have anything I really felt like doing, so I slept in. I left the room at around 11:00, at which hour it was sunny outside, though cold. I wandered toward center, casually shopping around for outer wear, which I could not find for less than twice the price of my nightly lodging. I started feeling pretty euphoric about the weather, because it felt just like Chicago ought to feel like at this time of year – cold and rainy, with mushy, wet, golden leaves smooshing underfoot. The country feels less like a former communist republic on its surface, but more like one of the northern countries, filled with hot, blond and dark-haired women, and bike paths. Everyone waits for the walk signal before crossing the street. I wandered around looking for lunch. I settled for a doner kebap, which is like gyros, only without so much meat. I wandered in to the edge of Tivoli Park via viaducts under the roadway and railway. The viaducts were decorated with some excellent graffiti. I had a brief conversation with a lonely reception clerk who was standing outside his museum of contemporary Slovenian history. I found a little stand selling good, greasy-smelling horse burgers, which I might have preferred for lunch. I pet a black cat who was looking forward to what seems to be a regular meal from the horse burger stand staff. I checked out the modern art museum, which sucked, though it was inexpensive. I felt lonely and homesick, and found the adjacent American Embassy, guarded by some local cop. I asked did I need a reason to visit, or could I just drop in for the hell of it? “You’re an American citizen? Sure, just follow the walkway there – Route 66!” I walked up to the front, peered in the window, which had a small lobby and a teller window. It seemed uninviting. I went back to the steps and admired the Eagle, with its shield, and the head pointed towards the talon holding the olive branch. I considered taking a picture of the American Embassy sign, with its eagle, but then figured maybe they would just as soon not have people walking up to the embassy and taking pictures and leaving. On the way out, I remarked to the guide that however nice it was to step on American soil, for a moment, it was fantastically boring. I dropped by the Cybercafe I had spotted the day before. The guy explained that the Internet had been broken there since yesterday, and I explained that maybe I’d brought bad luck to town, I’d leave tomorrow. I had a beer, instead, accompanied by the loud techno music the guy likes to play. I wrote in my journal, and then I drew a few pictures, concentrating on stuff like perspective and curved lines. The beer left me feeling really good – half a liter for about $1.50. I decided that two things I needed to do were consult my Lonely Planet book to figure out my next move, and drop by the train station to figure out where I could go and when. The train station and my room were both North of the center area where I was. I picked a new route to wander that way, and ended up in narrow streets bordered by tall buildings and a construction project. I saw some guys sitting around on the corner, drinking beers, with a bull-dog. Another beer struck me as a good idea, so when I found a corner store a block away, I got one, and some breakfast / travel provisions. I’d met what amounted to a dead end on my route, so I headed back around. The dog saw my grocery bag and figured I’d make a good friend. I asked the guys was he hungry, but no, he was The People’s Dog, he gets fed all the time, and he eats any time he can. I spent some time petting the dog, enjoying my beer, and talking to Tom, and his other friends, who were mostly named Tom, except for Matthew. They were all about my age. The story seemed to be that they were a crowd of unemployed, recovering drug addicts. One guy complained about his methadone addiction, another guy told me about the MBA he was wasting and the lovely girlfriend in France he had lost to his own dirty habits. Tom seemed surprised that I hadn’t had a joint since Amsterdam, and rolled a weak one that was passed around. Tom later bought two more beers, one for himself, and one for The People. I gave him some gum. It was a good way to spend the afternoon. Around 1900 I walked over to the movie theater, where they were showing “Red Dragon” in English with Slovenian subtitles. Not bad. At one point Lecter mouths the words “thank you” and I totally understood the lip movements and the “Hvala” of the subtitles, as “hvala” and “dober dan” are the two Slovenian expressions I use whenever I get the chance. It was dark and cold when the movie let out. I hustled home at a brisk pace to keep warm. Along the way I passed some giggly teenage boys who were casually vandalizing the antenna and windshield wipers of a Volkswagen Jetta. 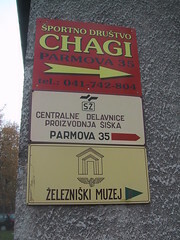 This way to Ljubljana’s Train Museum! Walking to the train station this morning, I spotted a street sign pointing towards the “Railway Museum” which the Tourist Information Center at the train station knew nothing about, when I dropped off my luggage. The railway information guy gave me a route to Lyon that departed Ljubljana at 1610, so I had several hours to kill. I studied my map and figured a promising position along the railway lines for a train museum to live, and headed over that way. And guys in a work shop restoring steam engines. Upstairs, I was greeted by the friendly curator, who explained that the TIC knew nothing about the train museum because it hadn’t opened yet – they were still putting the museum part of it together. I was, however, welcome to wander around, so long as I did so cautiously. There were more than half a dozen steam engines that they had already restored, resting indoors, and at least a half dozen more rusting away outside, waiting for some TLC. And spare parts everywhere, and dozens of men working on projects. This “train museum” was no casual volunteer undertaking. Judging by the Curator’s business card, it seemed to be a funded project of the state railway. Refreshing non-carbonated soft drink made of vegetable extract based on hips. Added natural flavour of passion fruit and peach. Total dry solid: min. 8%. Ingredients: water, sugar, extract of hips, citric acid, flavour. Seen from this perspective, the brown glop and buggy salad weren’t nearly as exotic as the iced tea, which tasted kind of like peach jello. Back at the train station I asked the price to Venicia, my first leg of the journey to Nice. It was more SIT than I had, and more than I wanted to spend, so I asked the price to Trieste instead, which was more SIT than I had, but I managed to fix this by giving a money changer €5. I figured that I could probably get away with using my train pass from Trieste, as it would be in Italy, after 7PM, counted against tomorrow, though it would be open to debate as to whether my patchwork itinerary counted as a “direct overnight train.” I could always ask ahead of time and see if there was enough time to purchase a proper ticket in euros from the ticket machine at Trieste. Changing money makes me crazy. I grabbed some super-tasty strawberry gelato on the way back, picked up my big red bag from the luggage storage, and blew another 170 SIT on a coffee topped with whipped cream, leaving me with just over 40 SIT, or about twenty American cents worth of souvenirs, before boarding the train for Venicia. My compartment was shared with a trio of Slovenian girls, one of whom cursed the train for resting an extra ten minutes in the station – though I recall sitting at border stations forever on my way in, on a train twenty-five minutes late. They later practiced English dialog on each other, while I worked some more on updating the log, sharing their giggles.